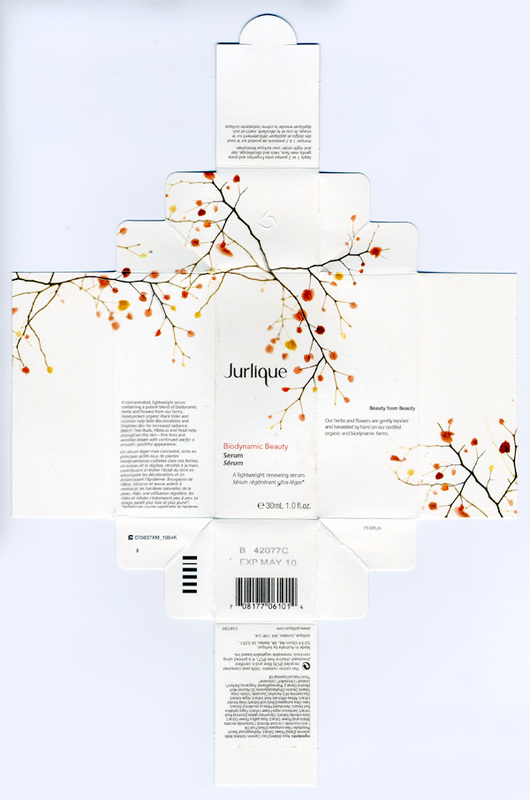 Last week i showed you the packaging from Jurlique’s Beauty from Beauty Tester Kit of minis that came in the egg carton like packaging with adorable little scaled down frosted glass bottles! 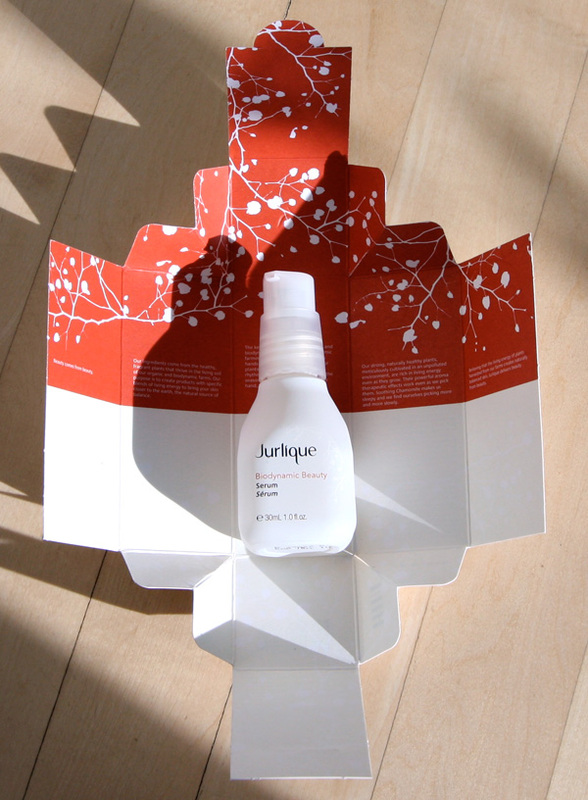 Well Jurlique was kind of enough to contact me, and sent some samples from the new line, and the packaging and opening experience of the new Jurlique Biodynamic Beauty Serum is awesome! I got so giddy i opened and closed it a few times before photographing the whole process for you and then scanning the full piece. Why is it so amazing? 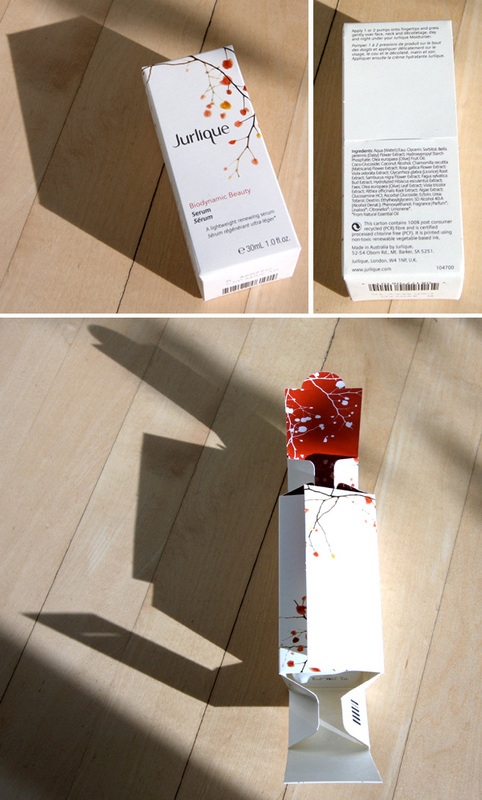 I love that they used a single piece for the packaging, which utilizes origami folding genius and a single tab that goes into a slit to hold it all together, and as you open it, it feels as if it presents the bottle to you in a surprisingly colorful interior, as well as putting more information about the product around the bottle… basically as soon as you pull out the tab, the box unfolds like a flower, really creating a a beautiful unboxing experience. 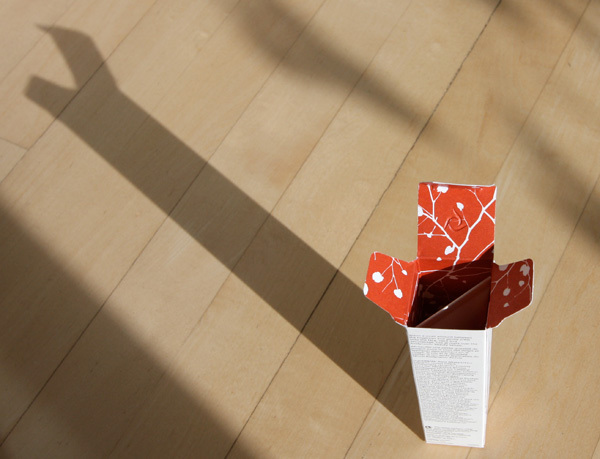 Awesome box design! 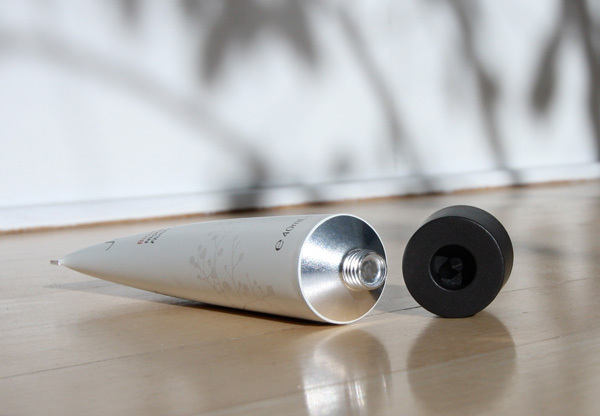 Beyond that excitement, you also have to take a look at the branding and packaging on the other products as well, they’ve managed to keep things looking natural and eco friendly, while still luxurious in their simplicity and use of recycled materials, clean fonts, and matte medicinal tubes (where you have to puncture it with the cap to open it), as well as my favorite slightly rounded - squarish - indented on the sides - frosted glass bottles which feel so great in your hand. They also scaled these glass bottles really nicely, so you can see a pic with the large Rosewater Balancing Mist, with the medium Biodynamic Beauty Serum, and then one of the minis from last time. 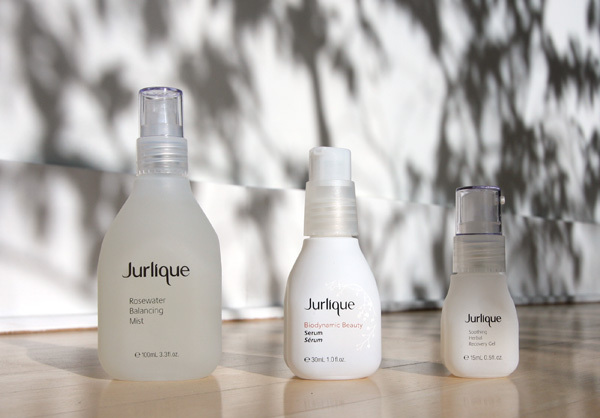 Ok, so i’m totally in a packaging gushing mood with Jurlique ~ and i’ve had a chance to try out the minis from the kit for a little while now, and i must say i’m impressed - it has all been extremely natural and effective, and awesomely calming in this stressful holiday season so far! (Favorites so far - Soothing Herbal Recovery Gel and my old favorite that i have in the not so fancy new packaging is their Rose Body Lotion) I’ll keep you posted as i try out more of their products ~ but for now, check out how sweet the packaging is through the pics on the next page ~ and if you’re feeling crafty, this box design could make for some gorgeous gift wrapping! Notcot, thanks for the great pictures and thoughtful post! I am so glad you liked the product and packaging! Hope all is well! 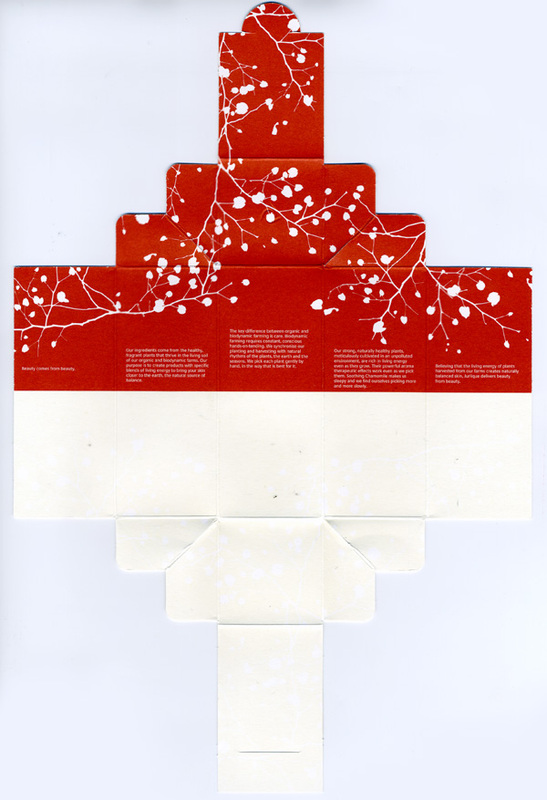 Seasons Greetings from Jurlique! I love seeing into the design process. I’ve been a fan of their for four or five years, and I their packaging transformation has been awe inspiring. hell, I even keep all of the packaging i love it so much. 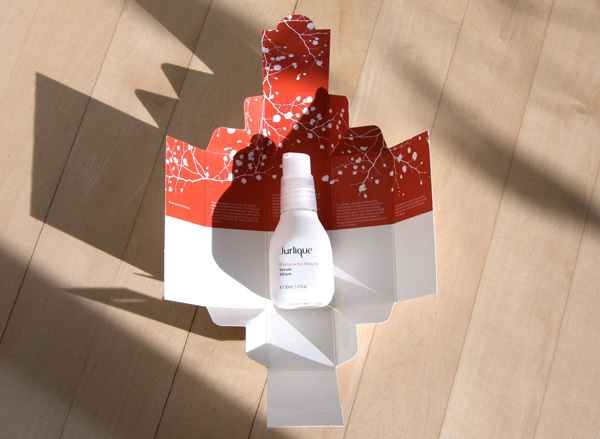 The products are the beyond wonderful - beautiful smelling, natural products that work. Oh, and they’ll take $1 off your purchase if you bring back the glass bottles to them to recycle. which is great because i’ve collected like 15 of them over the years. 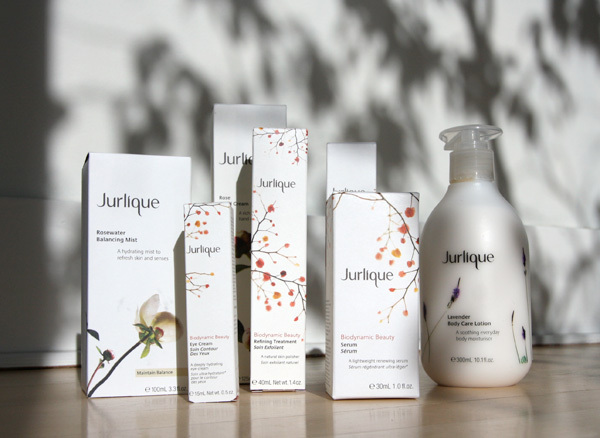 yeah, i heart jurlique. 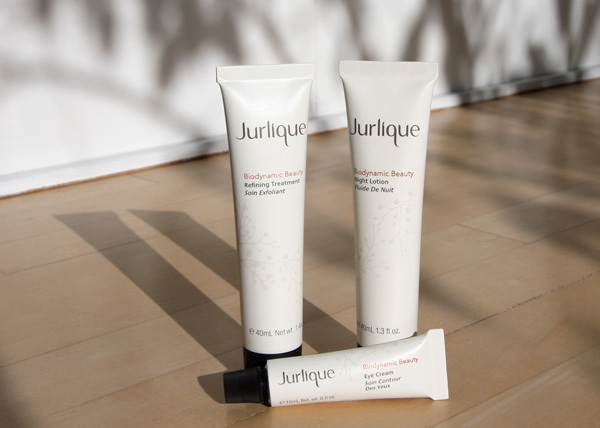 i heart jurlique big time. p.s. i’ve fallen in love with the new night lotion. it’s saving my face from the ravages of cold dry winter.